This project consists of drainage improvements, permanent erosion control, curb and gutter replacement, sidewalk/bicycle path replacement, fencing replacement and other incidental construction to approximately 1,800 linear feet of the outfall ditch that runs from west of Barnes Road to University Boulevard. Construction activities include installation of sheet piling, with limited right-of-way access west of Barnes Road; removal or trimming of trees within the public right-of-way that impede construction activities; and removal of private improvements that encroach on the public right-of-way and conflict with planned construction. Traffic will be maintained in accordance with FDOT design standards throughout the project. When lane closures are needed, drivers will be alerted in advance via portable, changing message signs. 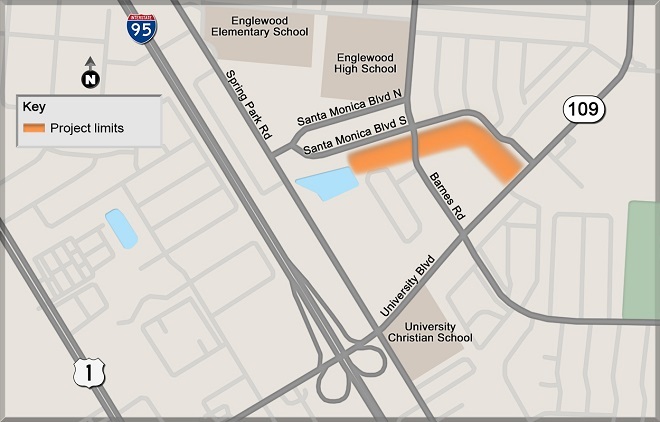 No lane closures will be permitted on University Boulevard from 6:30 a.m. to 7:30 p.m. Monday through Friday or 10 a.m. to 4 p.m. on Saturday. No lane closures will be permitted on Barnes Road on school days from one hour before to 30 minutes after school beginning and ending times. Pile driving may only be performed during the daylight hours of 7 a.m. to 7 p.m. Monday through Friday. SEMA Construction, Inc. is the contractor for this project.